I visited my flickr collection from Spirit Book workshops today as I worked on a big revision of my website which will debut on Thursday for the first day of spring. 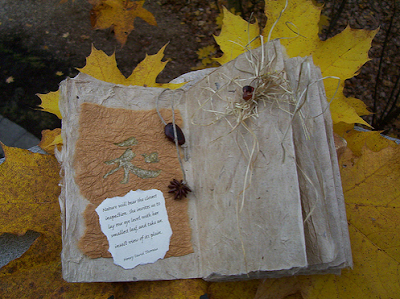 This book was by Jean DeVito who took the workshop at Wisdom House in Litchfield, CT. Looking at the flickr photos just made me feel envious that I can't make it to your classes, what lovely results. It would be great if you could do an online course for those of us who live far away. Thanks for the idea. I've never done or taken one before. I'll do some research.